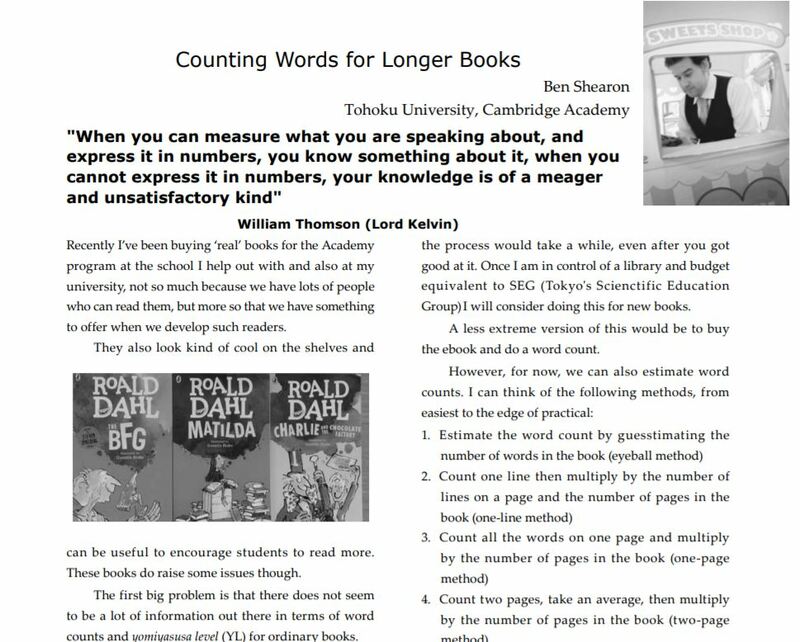 I just realised my article on estimating word counts for longer books is online here in the Extensive Reading Journal. 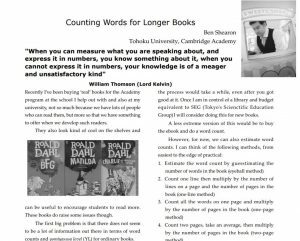 It compares various methods for estimating word counts of longer books. See what you think! We’re almost halfway through year three of the Cambridge Academy. As I wrote about in the last update we’re trying out our new Fluency Course this year along with larger classes (up to ten students). I’m also teaching six nights a week. So far, so good. The Fluency Course is going well with the first years, who are using it as their only materials. For the second and third years we have been using the first year timed reading texts alongside our original question cards and workbooks, as well as commercial textbooks. 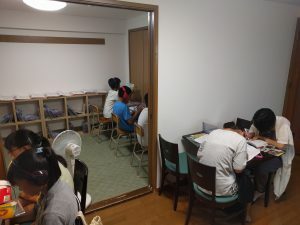 From this month the third years have been trying our second year Fluency Course. Right now we only have the first month written, so we have to write each month in order for the students to use it the following month. I am writing the second month as we speak (well, actually I am procrastinating by writing this blog post instead!). 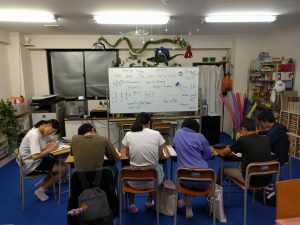 The junior high school students are streamed by school year (we have three first year, two second year, and one third year class), apart from advanced students who either get private classes or join a senior high school class. 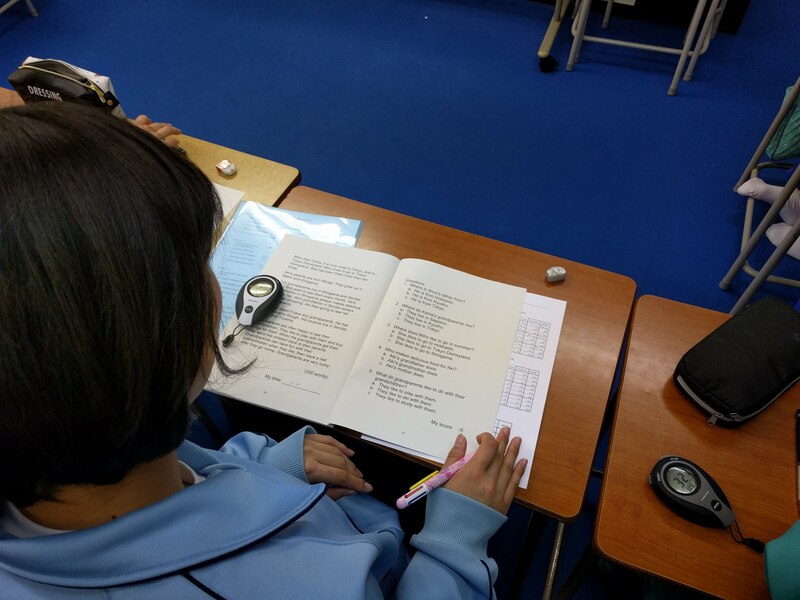 Senior high school students are streamed by level/ability, and we currently have three levels/classes. We made another big book order for YL0.3 and 0.4 taking us to roughly ten copies of each set, and I think we’ll probably do the same for 0.5 and 0.6 later in the year. The main developments have been in the input (reading) classes, and how we approach them now and in the future. At this point it seems like our current first years are doing better than our first years last year. I can think of several reasons. We made student manuals to help explain the system. We modeled what we wanted to see in the reading classes, both at the beginning and several weeks in when we saw that some students were going off track. We introduced a read to the teacher extra step when students finish a set. It seems likely that we should be able to aim for our students to reach intermediate level (YL1.1+) by the end of the third year of our course, having read over half a million words. If they then choose to stay with us during senior high school, we can try to get them to the lift-off stage where they go on to read 1-2 million words over the following three years. However, we are still not achieving the results that some of the best ER programs in Japan boast. This month I attended the Extensive Reading World Congress and was able to attend some very inspiring presentations by Japan Extensive Reading Association members. The results reported by some programs seem to be outlier students chosen for effect and do not represent the average student. In the case of SEG, they have three levels of class (advanced, normal, and low-level). Due to their student demographics (large number of returnees and kids expecting to get into Tokyo University), our student population is closest to their low-level classes, and we are achieving similar results so I feel much better about our program now. With guided ER it is important not to increase student levels linearly, but instead to have them fluctuate up and down. 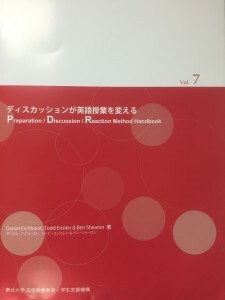 This is expressed in the concepts of kirin (giraffe) reading, where students read above their baseline level, and panda reading, where they read below. Through judicious use of these two variations, we should be able to have our students progress slightly faster than they have done until now. We have identified three types of student at our school, each of which requires slightly different treatment. Fast students: can advance quickly, only reading a couple of books/sets at each level. Goals are to get to intermediate then find a series they enjoy in order to do narrow reading. I think our current approach is fine with these students, but we might be able to do better at introducing books/encouraging them to stretch themselves. Normal students: can advance at a normal pace, reading about 2/3 of our readers at each level while also doing kirin reading and panda reading. Goals are to level up as quickly as possible without getting ahead of their understanding. I think we can help these students move quicker by judicious coaching. Slow students: can advance only slowly, often requiring extra reading at each level before moving up. Kirin reading may help these students and is something we will investigate. Perhaps we could provide more support by reading with these students or helping them understand/interact with the texts. Compared to SEG, we have about half the in-class reading time, and much more importantly a much less motivated and academically-gifted student body. Despite these restrictions, I am hopeful we’ll be able to help most of our students achieve meaningful progress in their English skills. The obstacle is that even for SEG it seems to take 4-5 years before the effects really start to show. Getting students (and their parents) to persist until they reap the benefits of their effort seems to be the tricky part. We’re getting better at this, and are losing fewer students than we were in the first year. Last year we almost filled our three classes of ten. It looks like we’ll have around thirty students coming up from elementary school classes, so should have similar numbers in April. Do we increase our class limits to twelve? I think it would work pedagogically, and of course it would make the classes more profitable, but we’d really be stretching the physical limits of both our input and output classrooms. Right now ten is snug, so twelve might be too tight. Who is going to teach the classes? We could go in one of four directions: I keep teaching both input and output classes, alongside other teachers and our interns. I teach all the output classes, and leave the input classes to our interns. I leave the output classes to our teachers and teach all the input classes. I ask our teachers and interns to teach all the classes, and float, observing and helping as needed. I think it might be a bit soon for the last option. Running the Academy is still one of the most fun and interesting things I have done as a teacher, and I am really looking forward to figuring out how to make the program even better over the next few years.